ls your dryer running more slowly than when it was brand new? Do you see water stains on the ceiling and can't figure out what's causing them because there are no water pipes in that area? Or, does your attic have a lot of moisture and as a result, shingles keep deteriorating? ls there a musty moldy smell that permeates your house when you run the dryer? I recently ran into this some of these symptoms when I was at my parents' home. Their Maytag dryer, which was old, took about an hour and a half to dry a load of clothes. This was costing them a lot of money and they were spending way too much time doing laundry. They were considering purchasing a new dryer. But we know that Maytag dryers never break down because the Maytag repair man is always looking for something to do to occupy his time. Right? I had an advantage that most people don't. I have been through Certified Dryer Exhaust Technician (CDET) training and certification by the Chimney Safety lnstitute of America. As a result, I knew what to look for. 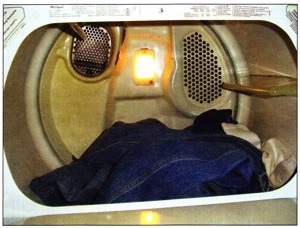 These problems can be a direct result of how the dryer is vented. It used to be that most dryers were located next to an outside wall and vented directly out the side. ln newer homes the dryer vent may run straight up. Or it may run up a wall, across a ceiling then out an eave. Some dryer vents incorrectly terminate in attics where the moisture can cause early deterioration of the roofing structure. Lint gets blown all over the attic creating a mess and a potential fire hazard. A load of clothes can contain 1 - 1 1/2 gallons of water. With this much moisture, how can lint cause a fire? Just as a dryer dries your clothes, it also dries lint. Have you ever ignited a piece of lint? lt burns incredibly fast. lt is very flammable in its dry form. Sometimes lint becomes crusted on the dryer vent after repeatedly drying. Add strands of human hair, pet hair and other fibers and you could end up with a blockage resulting in slow drying times and a probable dryer vent fire. As the vent becomes more blocked it causes the dryer to overheat which increases the temperature in the vent where it may ignite the flammable lint. According to the U.S. Fire Administration National Fire Data Center clothes dryers annually account for about 12,700 structure fires, 15 deaths and 300 injuries in residential homes. Failure to clean is the #1 reason for these fires, accounting for about 70% of these fires. There are many factors that can contribute to a fire and a CDET Certified professional can pinpoint the risks. ln my parents' home, lightweight aluminum duct ran from the dryer up through the ceiling and to the exterior. lt was partially blocked and disconnected in the ceiling, which allowed moisture to vent into the floor / ceiling cavity. Hence the staining, but that was the least of my worries. Had my parents continued to operate the dryer this way, it would have eventually overheated, which may have ignited the lint, which would have probably burned through the lightweight duct, literally blowing fire into the ceiling / floor cavity. ls your dryer ducting installed correctly? Lightweight aluminum flex has its limitations and plastic duct should never be used. Again, lint is easily ignitable and highly flammable and a fire will melt plastic duct in seconds. I thought about this while I was working in my garage this weekend. I also have a dryer installed in the center of my home. As I looked up at my dryer vent cleaning tools I decided that even though I had recently cleaned my duct in November that I probably didn't need to clean it but l thought I'd check it out. Surprisingly, I had more lint build-up than ever before. My dog's long fur had caused a couple of partial blockages allowing lint to pack in behind it. Had I not been aware of the dangers of plugged dryer vents I might have had a fire today, tomorrow or next month. lt's like the roll of the dice. Don't take chances with your safety. Have your dryer vent inspected by a Certified Dryer Exhaust Technician (CDET). To find a CDET in your area, check www.csia.org. Karen Lamansky has been involved with the hearth industry for over 20 years and is the author of "Fireplace Design ldeas" published by Creative Homeowner. Reprinted, with permission, from the July 2010 issue of Ihe Chimney Sweep News, an independent trade magazine for chimney service professionals. Jim Gillam, editor/publisher. 541-882-5196.